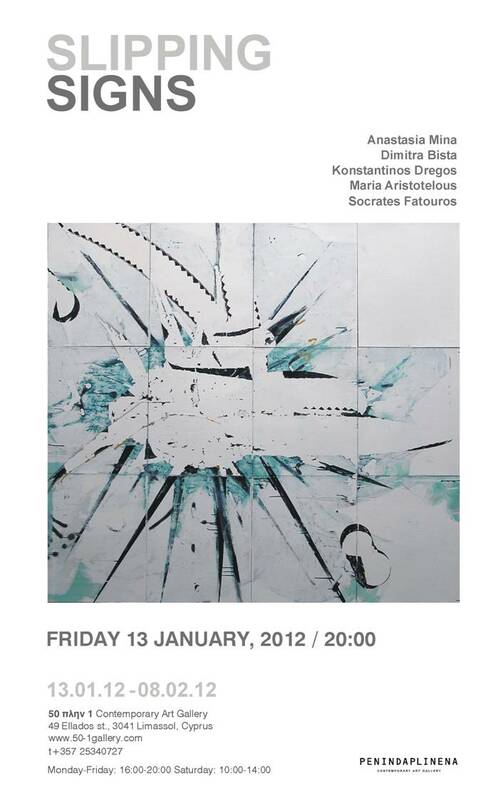 Penindaplinena Gallery is pleased to present the group show entitled, Slipping Signs. Landscapes seem seismic when burning colours from the sky and expressionistic strokes of thick paint envelop the canvas. 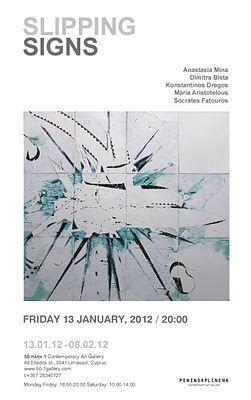 In this group show at Penindaplinena Gallery, explosive remnants of material rephrase interruptions and form fresh beginnings. The exhibition Slipping Signs showcases five multi-media artists working from scapes to escapes, scopes, styles and space, as they seize them at shifty and slippery moments. In these works, random and anticipated transformations transpire from dark to light, from reflection to position, from networks of lines to swelling surfaces, addressing matters of identity and continuation, repetition and inscription, site and interiority, frame and de-centralization. A starting point for many of these artists’ works takes off from a given inner place, or city, where, although the intention seems to be to move in this identifying place of ‘rest’, there is a longing to explore disruptions that ‘promising’ sites do not anticipate. The works composing the exhibition Slipping Signs evoke a new habitat to revive vision, to dream another dream, to embark on re-constructing intimate possibilities where the impulse of identifying insists on slithering. Comfortable in zones of indefinite and infinite connections, these artists’ works vigorously surface through a distinct treatment of pencil, paper, ink, acrylic, canvas and cardboard. Maria Aristotelous’ thick coats of paint in long strokes splattered in apparently unintended smears are pencil lined, like fluid feathers of interaction and interruption in these painting’s reflections. Dimitra Bista’s refined pencil on paper drawings subtly move in a net of lines and scratches which seem to meet somewhere between a deliberate de-centralization of ‘beginning’, and, a lack of colour and neat symmetry. Although working with seemingly inflexible materials, such as leather and porcelain, glass plaster and tar, Konstantinos Dregos’ sculptures, like flesh, flow organically through space without ever trapping these forms in a solid surface. Paint drips on canvas like water seething before the bubbles morph into flowers, half blooming, half fleeing. In a leveling and surging force, the drawings of Anastasia Mina work like pencil and writing; smooth surface and compulsive depth; an urging and urgent process of impulsive intensity which, while engrossed in a swirling repetition, also dissolves the raw residues of lead to reach a liberating coexistence of black on white. In City End, Socrates Fatouros handles the textures of oil and acrylic on cardboard through a fragile vigor of colour, which erupts, in a volcanic temper, from the centre out. The city doesn’t end somewhere; it unfolds. No longer a heart, the edges of this city extend beyond an ‘identifiable’ city, or as in the sculpture, City 1, the sign and the city stand tall yet dizzy, suspended from a precarious pole.